A lot of details were leaked about the upcoming Fallout game. They say an ex-employee leaked them as revenge, because she was fired. Fallout 4 is set in Boston and surroundings, in the year 2287, exactly ten years after the events of Fallout 3. Downtown Boston was captured by ‘The Institute’, a group of students and tech-fanatics. The Fallout 4 map is three times bigger than the world of Skyrim. THREE TIMES! Bethesda aims to create an interactive and realistic world, that offers lots of things for the player to explore. Boston’s surroundings is a wasteland with small towns and some vaults. The Brotherhood of Steel returns, with control over Logan International Airport. They want to start a war against The Institute. You will only be able to create a male character (sorry girls!) that has a voice (WOW). He will narrate the story as well (voice-overs). He is known as The Officer. The game starts off with a nuclear explosion. After the explosion you wake up in a destroyed building, next to your wife, who didn’t survive the explosion. Ow yeah: robots went berserk and are killing and kidnapping people. Yikes. Three Dog (Aaaawoooooo!) is back, but you can’t find him. You can, however, hear him. Same goes for Bryan Wilks, the little boy you saved in Fallout 3, in the town overrun by f’ed up spiders. He is nineteen now and works for the Talon Company, this time smaller than before, with headquarters in a downtown Boston bunker. The Railroad is back as well; bigger and stronger than before. Additionally, your annoying, hostile friends the Raiders are back. Information about Wasteland crawlers was leaked as well. We’ll see them good ol’ Super Mutants, Ghouls, Vicious Dogs, but also Feral Cats, and Spore Carriers. Fallout 4 will be released for PS4, X1, and PC.. but also for PS3 and Xbox 360 (but not at launch, some time later). June 2015 – Fallout 4 announcement. Trailer. June 2016 – Fallout spinoff announced, this spinoff will be developed by Behaviour Interactive. A release date was found as well, but it was removed shortly after. However, nothing escapes the all-seeing eyes of the internet of course! There’s a date in the corner, the estimated ship date: TBA 2015. This indicates, it will be released in 2015. Combined with the roadmap that was leaked, it’s pretty sure it will be released in 2015. SUUUWEEEET! 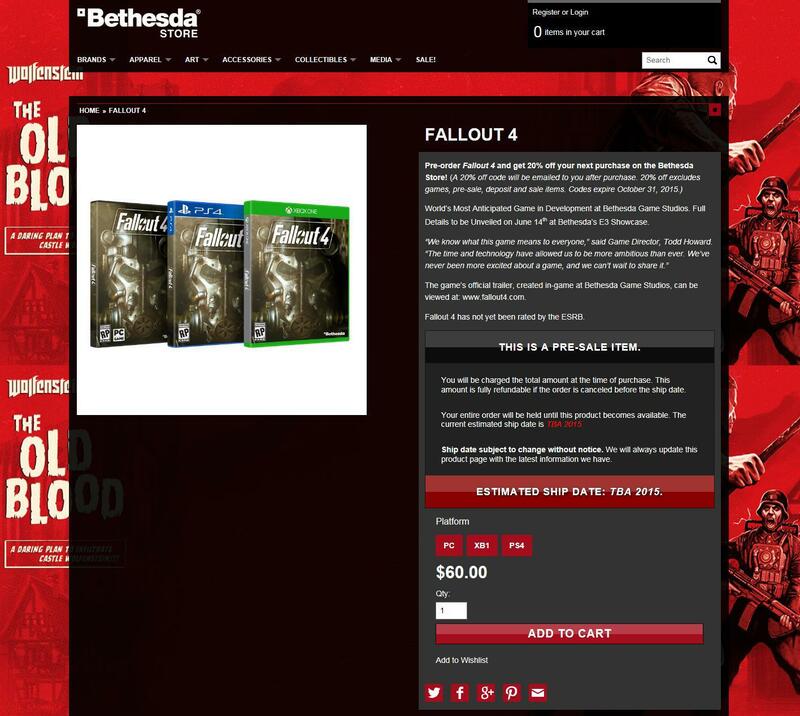 There you have it, a big Fallout 4 information bomb!